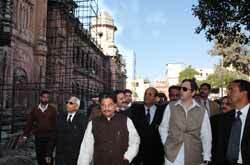 Jammu February 27 – Chief Minister Mr. Omar Abdullah today inspected the Mubarak Mandi Heritage Complex and took a firsthand appraisal of the renovation works of the prestigious project launched to preserve and restore the glory of the Mubarak Mandi Complex. The Chief Minister went around the Complex and visited Darbar Hall, Grey Hall, Green Hall, Museum and other areas where restoration work is under progress. Emphasising the need for preservation and protection of heritage structures, Mr. Abdullah said that Mubarak Mandi Complex has a historical, cultural and architectural value which is required to be restored to its old glory and showcased for national and international tourists. The Chief Minister said he would soon convene a meeting of the Governing Body of the Heritage Society and review all aspects in detail. Mr. Abdullah also visited the Dogra Art Museum within the Complex and enquired about various antique items on display. He was informed that more than 5,500 works of exquisite art, spanning over 1,600 years, are in the Museum, which is also known for its world- famous collection of Rasmanjari series of Basholi paintings, miniature paintings of different schools, manuscripts, Dogra armoury, numismatics, Dogra customs, jewellery, metal-ware, musical instruments and gallery of modern art. The Chief Minister was accompanied by the Minister for Tourism and Culture, Mr. Nawang Rigzin Jora, MLC and former Minister, Mr. Gulchain Singh Charak, Divisional Commissioner, Jammu, Dr. Pawan Kotwal and other senior officers. Mr. Abdullah was informed that the Central Government has sanctioned Rs. 4.37 crore under the Major Destination Development Scheme for the Mubarak Mandi Heritage Project, out of which Rs. 3 crore have been released for execution of works. The State Government has released Rs. 1.5 crore for the project. The Mubarak Mandi Jammu Heritage Society, looking after the restoration and preservation of the project, has been constituted by the Government in 2002 and Chief Minister is the Chairman of the Governing Body of the Society. The complex is being developed as a self-sustaining tourism destination and a socio-cultural heritage centre. The Archaeological Survey of India is presently looking after the restoration work of the Complex. Mr. Charak welcomed the Chief Minister and brought to his notice several issues requiring urgent attention. These include shifting of electric substation of neighbourhood to respective area, budgetary support in the shape of grant-in-aid, stationing of police, fire and emergency post in the Complex, posting of an officer of the rank of Deputy Secretary to manage the Society affairs, vacation of Complex by Government departments and preparation of revival of zonal plan for adjoining areas.